The most important book in American history? The heart of the book covers the debates over race, slavery, and the extent to which Uncle Tom's Cabin—or any novel, for that matter—can be said to "change" history. Reynolds argues vehemently in favor of fiction's ability to do so, and he makes a very good case for it. In fact, Reynolds takes the argument for the powerful impact of Uncle Tom's Cabin to greater lengths than any previous critic. If at times he might be said to exaggerate, I think his basic point is accurate: yes, the novel has probably had a more profound effect, and has spurred more reaction, both positive and negative, than any other book in American history. Reynolds has always been one to go to painstaking lengths in supporting such assertions. His analysis of the deeply racist underpinnings of the culture, extending on into the early and middle parts of the 20th century, and his coverage of the abolitionist debates, while not surprising for experts in the field, are nonetheless excellent. The volume ends with a lengthy discussion of the reception history of Uncle Tom's Cabin. This brilliant account continues to show the impact of Stowe's characters and plot, even when those characters are taken wildly out of context (as in the plethora of "Tom shows," or in Shirley Temple movies, Bugs Bunny cartoons, The King and I, and the mega-hit mini-series Roots in the 1970s, not to mention such recent depictions of "Tom-like" African American sidekicks in The Green Mile, Driving Miss Daisy, and The Shawshank Redemption). Reynolds' discussion of the infamous Tom shows is one of the highlights of the book, since for many years these melodramatic renderings have been primarily understood as little more than horrendous stereotyping. 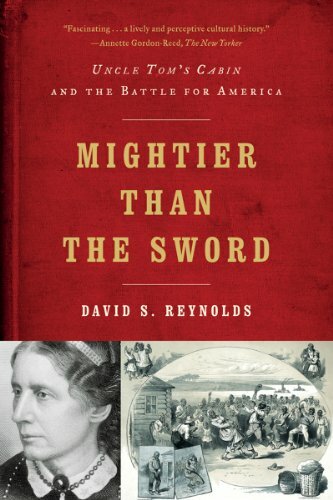 Reynolds claims otherwise, arguing that they inspired a new kind of sympathy for black Americans after the Civil War. For Reynolds, the Tom shows presented heroic and admirable black characters to largely multicultural popular audiences, and in so doing probably achieved the largest popular audience for positive African American characters of any medium for many decades. Further, it is not commonly realized that the Tom shows highlighted the spirituals and slave songs, filled with the deep yearning and hope that so inspired such progressive leaders as Thomas Wentworth Higginson, Mark Twain, and W. E. B. Du Bois. In most cases, Reynolds claims, rather provocatively against the critical current, these stage plays established the dignity and humane aspects of black characters, and the laudable nature of their authentic Christian faith, just like the original Tom, when rightly understood. Obviously, there is much room for debate on these issues—and classroom experience tells me that the racial depictions are always a primary concern for students reading the novel for the first time. But Reynolds brings to bear the sheer authority of one of our senior critics, and we need to listen carefully to what he's saying. His analysis is particularly moving, for example, in his discussion of black actors in the 1930s, including Hattie McDaniel of Gone with the Wind fame and Bill "Bojangles" Robinson. These actors were pioneers, says Reynolds, and it's high time we recognized their contributions to American cultural history. When McDaniel won the Oscar for playing a slave "mammie" in Gone with the Wind (granted, a film dripping with southern sympathies and obvious, offensive racial connotations), she stated, "I consider this recognition a step further for the race, rather than personal progress." Hattie desired to be understood as a race woman, even as she portrayed the subservient house slave. In the context of their courage, Reynolds urges us to recognize the achievements of such pioneers rather than figuring them as "despicable sell-outs" to the white master, and thus associated with the epithet "Uncle Tom" made famous by James Baldwin. Reynolds catalogues the long list of African Americans who have been called "Uncle Toms" over the years, and perhaps surprisingly it includes just about every black leader: not just those actors mentioned above, but groundbreaking athletes like Jackie Robinson, Willie Mays, and Hank Aaron, and even radicals like Du Bois, Martin Luther King, Malcolm X, and Barack Obama have all, at one time or another, been labeled with the epithet. Reynolds is correct to call our attention to the irony of this bad habit: no matter what a black man or woman does, it's never quite radical enough for some observers.